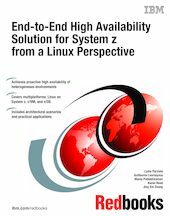 As Linux on System z becomes more prevalent and mainstream in the industry, the need for it to deliver higher levels of availability is increasing. This IBM Redbooks publication starts with an explanation of high availability (HA) fundamentals such as HA concepts and terminology. It continues with a discussion of why a business needs to consider an HA solution and then explains how to determine your business single points of failure. We outline the components of a high availability solution and describe these components. Then we provide some architectural scenarios and demonstrate how to plan and decide an implementation of an end-to-end HA solution, from Linux on System z database scenarios to z/OS, and include storage, network, z/VM, Linux, and middleware. This implementation includes the IBM Tivoli System Automation for Multiplatforms (TSA MP), which monitors and automates applications distributed across Linux, AIX®, and z/OS® operating systems, as well as a GDPS based solution. It includes the planning for an end-to-end scenario, considering Linux on System z, z/VM, and z/OS operating environments, and the middleware used. The TSA MP implements HA for infrastructure, network, operating systems, and applications across multiple platforms and is compared to a Linux HA implementation based on open source Linux-HA, which is Linux only. Are Single Points of Failure lurking in your End-to-end applications?